Don’t limit your next work lunch to last night’s leftovers or a sad salad of produce scraps from the fridge. There’s an entire world of authentic cuisine and delicious comfort food driving around right outside your office door. In a city like DC especially, the food truck game has skyrocketed far beyond soft pretzels and cheap eats, thanks to award-winning chefs and local entrepreneurs bringing incredibly tasty dishes to the streets. Trucks flock to hubs like Farragut Square and Georgetown, making them easily accessible for a number of downtown DC office workers. To help out those of you running from meeting to meeting all day, we crafted this handy guide to some of the city’s tastiest trucks, as well as where to find them throughout the week. Some of them are even free. (Did that get your attention?) Yeah, that’s right: Chase has partnered with several local chefs and restaurants to bring a variety of complimentary dishes to the public on their very own food truck, a culinary experience dubbed “What Makes DC.” It’s all part of a celebration of the JPMorgan Chase market expansion into to the Greater Washington, D.C. area. Now that’s putting the sad desk lunch to shame. At Abunai, you can get a taste of the Aloha State without having to use a single vacation day. Here, Akina Harada, originally from Honolulu, dishes up modern versions of Hawaiian staples, from kalua pig to their crowd favorite: Spam musubi. At this truck, the Spam is fried crispy, then wrapped in rice and nori and finished with a ginger-scallions sauce and sesame seeds -- just the way you’ll find it in Oahu. 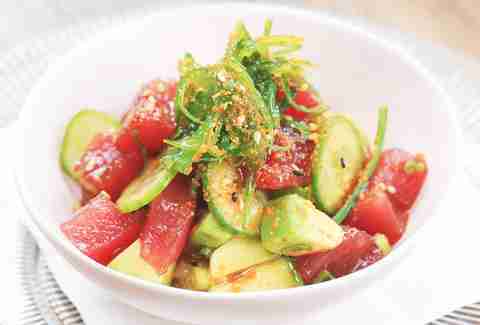 After only a few years at the food truck game, Harada has now expanded into a brick and mortar location downtown that serves made-to-order poke bowls, too, if you’re looking to experience even more Hawaiian cuisine. 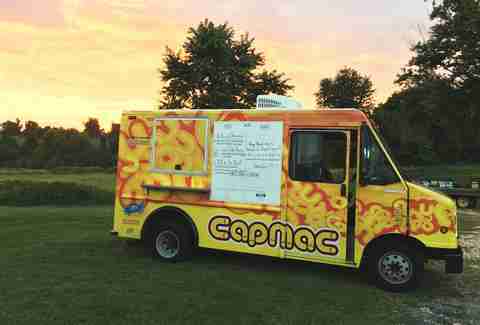 What brought a former Olympic rower into the food truck game? His mom, of course, aka their “biggest supporter,” says Giuseppe Lanzone, who co-founded Peruvian Brothers with his real-life brother, Mario. 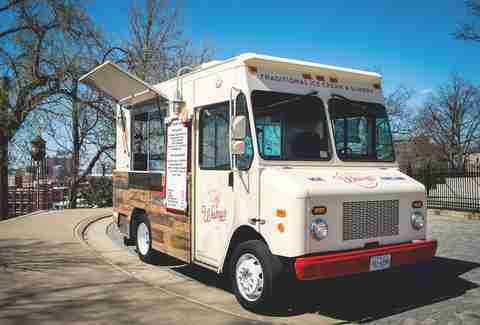 Encouraged to start the truck by their mother, the Lanzone brothers hit the streets in 2012, bringing classic recipes from their native Peru to the city. One example? Their most popular menu item, which Giuseppe Lanzone calls “Peru’s iconic sandwich” or pan con chicharron. It’s loaded with pork tenderloin, sweet potato, and Peruvian salsa criolla, piled on daily fresh made bread they source from a local factory in Sterling, VA. “The exact recipe we knew and loved back home in Peru,” says Lanzone. Millie’s Spring Valley takes New England style seafood and gives it a baja, California-style touch, adding tons of fresh ingredients to compliment the dishes. When they partner with Chase Oct. 5, they’ll be bringing some of the best samples of that cooking, like a Blackened Mahi Mahi Taco, complete with horseradish slaw, avo and lime sour cream, a tuna poke with all the classic fixings, and a swordfish kebob, served with a feta mint rice salad and lemon yogurt sauce. They’ll be staking out the corner of 13th and F Street on October 5, and don’t worry about bringing your wallet. Gourmet hot dogs with unique flavor combos frequently found in Foggy Bottom at GWU. Check Twitter for the latest schedules. After noticing that, as college students, there were few affordable food options in DC they actually wanted to spend their cash on, the founders of Swizzler (Jesse Konig, Ben Johnson, and Jack Zimmermann) decided to bring it themselves. “There’s nothing more American than a hotdog, but Swizzler is teaching an old dog new tricks,” Konig says. 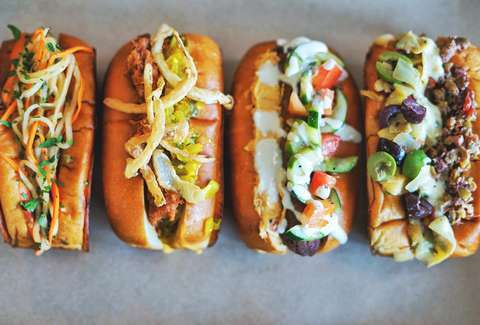 Those new tricks include sourcing 100% grass-fed beef for their dogs and spiral-cutting them for better flavor and “top-ability” -- AKA the best part of the gourmet hot dog experience. 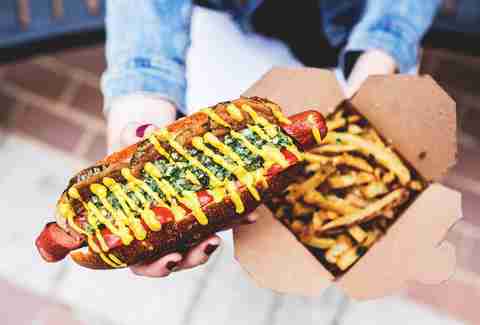 For a lunch that will most likely keep you full until dinner, Konig recommends their fan favorite #TreatYoSelf combo with the Feast Mode -- a hot dog bedecked with caramelized onions, whipped herb goat cheese, black pepper honey, and candied jalapenos, and served with truffle parmesan fries. Anna Bran-Leis is no stranger to DC’s food truck game. She got her start as owner of DC Empanadas, one of the most popular trucks in the area (if the crowds at Union Market are any sign). She’s since moved to full service restaurant at Taqueria Del Barrio, where they make more than 1,000 homemade tortillas nightly to feed the crowds. While Bran-Leis won’t be bringing empanadas to the DC Delights Truck, she will be featuring her Tinga Chimichanga Tacos, with shredded chicken in a smoky tomato sauce and topped with lettuce, tomato, and crema. You’ll catch them (again, for free) at Capitol Hill on northwest New York Avenue between 6th and 7th on October 12, then in Foggy Bottom on C Street northwest between 18th and 19th on October 19. On a chilly fall day in DC, few things are more comforting than a hot cup of umami-packed pho. Whether you’re already on the pho wagon or if you’ve never tried Vietnamese cuisine in your life, PhoWheels has got you covered. It’s a family business of Houston natives with Chef Huy Nguyen at the helm, who wanted to bring the authentic flavors of their home city (and home kitchen) to the DC… with a few twists. That means classics like steaming pho in a sippable to-go cup with add-ons like a deep fried Chinese bread stick, banh mi with all the traditional toppings, and Vietnamese style fusion tacos, with options like pork belly, chicken, or mushroom and onion, served in a roti canai (a Malaysian flatbread). Speaking of comfort, nothing compares to Grammy’s cooking -- especially for Puddin’ owner Toyin Alli. The Cajun and Gullah-inspired Puddin’ is a comfort-food mecca, with warming foods like shrimp ‘n grits, po’boys, and bread puddin’ on the menu -- all inspired by Alli’s grandmother. 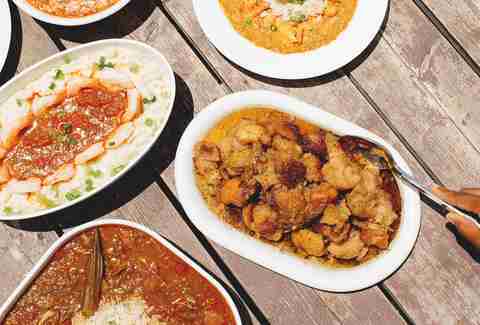 “My earliest life memories are of food,” says Alli. “I have never had a bad meal prepared by [my] Grammy and she is the inspiration for all of my recipes at Puddin’.” If you can’t catch the truck, you’ll find Alli’s stick-to-your-ribs dishes at Union Market, where her Grammy often joins her to serve hungry crowds because to Alli: “Everyone needs to get a bit of Grammy in their lives.” We couldn’t agree more. The DC half smoke is not a hot dog. It’s a sausage, for sure, but it’s bigger, and packed with more flavor than what you’ll find on a grill at your neighbor's backyard barbecue. Halfsmoke, the restaurant, specializes in these local delicacies, and when they partner with Chase, they’ll be bringing their DC Signature Sausage to the party. Served on a brioche bun and topped with a signature mustard slaw, beer cheese, hickory-smoked bacon, and onion crisps, it’s one item the eatery is most known for. To round things out, they’re also making wood grilled chicken wings and serving them with their housemade version of DC’s next favorite speciality: mumbo sauce -- a red/orange sauce that’s sweet, spicy, and tangy all at once. You’ll find them on New Hampshire Ave toward Washington Circle. If you’re going to indulge and get the pasta, it better be worth it -- meaning fresh produce, unique flavors, and (or course) tasty sauces. If you’re looking for something tried, true, and cheesy you can always grab their most popular menu item, the Classic Mac. As owner Chef Josh Warner says, “You can’t beat aged cheddar mac n’ cheese topped with more cheese, and Cheez-Its.” If you’re veering towards wanting something a little healthier, they rotate a seasonal pasta onto the menu weekly, inspired by what they can get at the local farmers markets. They also have salads, but, let’s be real: you’re here for the cheese. When it’s a real long day at work, sometimes you need to skip lunch and head right for dessert -- that’s where Westray comes in. Owner Westray Paul says his favorite flavor is actually, drumroll, the Papua New Guinea Vanilla Bean. I guess you can’t argue with the classics, especially when they’re made by hand. That doesn’t mean they don’t get a little crazy with the flavors though -- Westray says their most popular is the brown butter pecan, thanks to deliciously toasted nuts, along with a dash of salt and vanilla. Want something even wilder? Try the southern maple cornbread of Thai tea. If you’re feeling more adventurous you can go for something, literally, on their “for the more adventurous” menu, such as southern maple cornbread or Thai tea… and maybe take a little longer on your lunch break before heading back to the grind.